The Spitalfields Music Festival is back this December, Now in its 41st year, the East London festival has brought in André de Ridder as guest curator. André is one of the most influential and daring conductors working across genre boundaries in music today; Artistic Director of Finland’s largest Contemporary Music Festival, founder of the ground-breaking ensemble s t a r g a z e (recent projects include the BBC David BowieProm), and collaborator with artists including Nico Muhly, Damon Albarn, Max Richter, Uri Caine, Brian Eno and Jonny Greenwood of Radiohead. So I’m expecting some genre-bending content to excite my jaded ears. I’ve been invited to architect George Dance the Elder’s elegant Shoreditch Church at the trendier end of Shoreditch High Street for an evening excitingly entitled Hyperchromatic Counterpoint featuring three solo musicians – Veli Kujala, James McVinnie and Aart Strootman – who will be exploring counterpoint across four centuries. 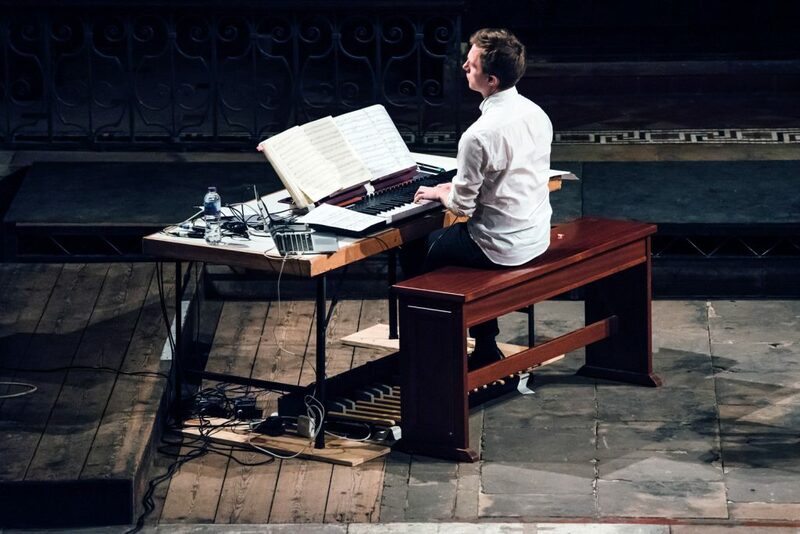 James McVinnie performed selected movements from JS Bach’s Art of Fugue using an electronic keyboard and pedals and a virtual organ with the sound being projected by a pair of stereo speakers with sub-basses. Being near the front it was a very different experience to hearing the music coming out of organ pipes distributed across the soundstage with the articulations being more staccato and distinct and allowing the contrapuntal lines to be heard with clarity. McVinnie’s performance was respectful making the music rather than his performance the centre of attention. Aart Strootman’s take on Steve Reich’s seminal Electric Counterpoint was similarly restrained. Working with sequenced accompaniment he spun iridescent guitar lines that weaved in and out of Reich’s often dense repetitive rhythmic textures. This is one of my favourite Reich compositions and Strootman did it justice. 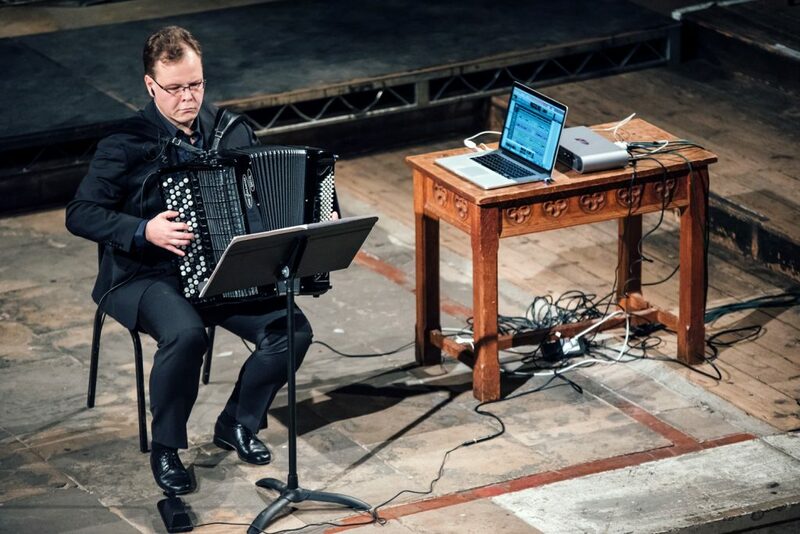 Referencing both Bach and Reich’s work, Veli Kujala’s Hyperchromatic Counterpoint extends the melodic realm with his custom-built accordion into an expansive and psychedelic sound-world. Starting with a very Reichian opening movement he moved into a section where longs single notes slowly built into chords. 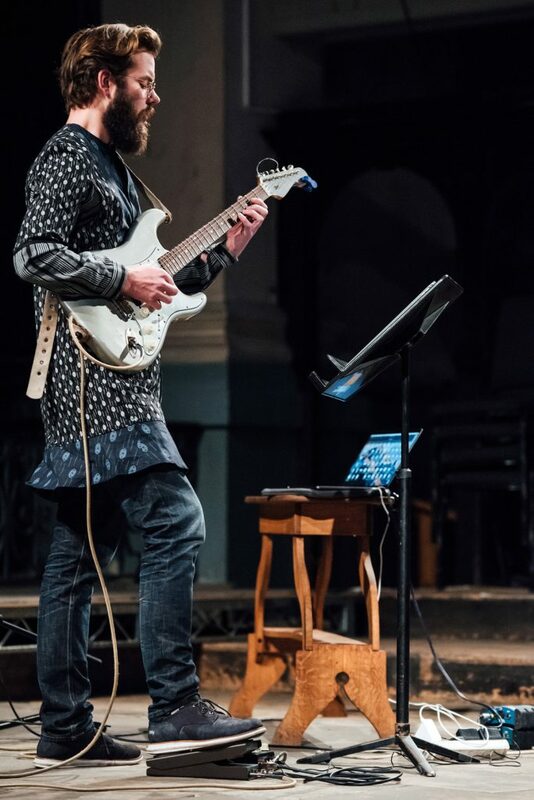 There were strange, bluesy harmonic juxtapositions, a psychedelic counterpoint with wavering tunings, a trippy discordant sequenced accompaniment ending with a Bachian flourish, microtonal ring modulated clusters and a percussive loop that built into an atonal and increasingly frenetic jig. In other words, he put everything and the kitchen sink into the composition. After a gong strike, a quasi-fugal, atonal preprogrammed section began allowing Kujala to put down his accordion and walked around the hall leaving an empty seat. I loved it! The evening ended with James McVinnie returning to the organ and performing the unfinished contrapuntus XIV from J.S.Bach’s Art of Fugue that ends abruptly when the 3rd subject (the notes of which spell out Bach’s name) enters as it was unfinished due to Bach’s death. Rather than play one of the several completions of the fugue, McVinnie ended at the point where Bach wrote his final notes in dramatic style. The rest of this year’s Spitalfields Music Festival includes artists from a range of musical styles including Bengali folk, rap, classical, soul and jazz. There’s a reinterpretation of Schumann’s Dichterliebe inside 16 historic Huguenot Houses of Spitalfields and authentic performances of Monteverdi’s Eighth Book of Madrigals. For art lovers there is an exhibition of new artwork by Turner Prize nominee Mark Titchner that explores the links between post-punk band Fugazi and classical masters Schumann and Monteverdi, and classical collides with techno, experimental and electronic as André de Ridder’s pioneering s t a r g a z e collective perform a reimagining of Daniel Brandt’s Eternal Something. This is an exciting festival that isn’t afraid to break down cultural boundaries in a way that is accessible but without diluting the integrity of the art and it should be supported! 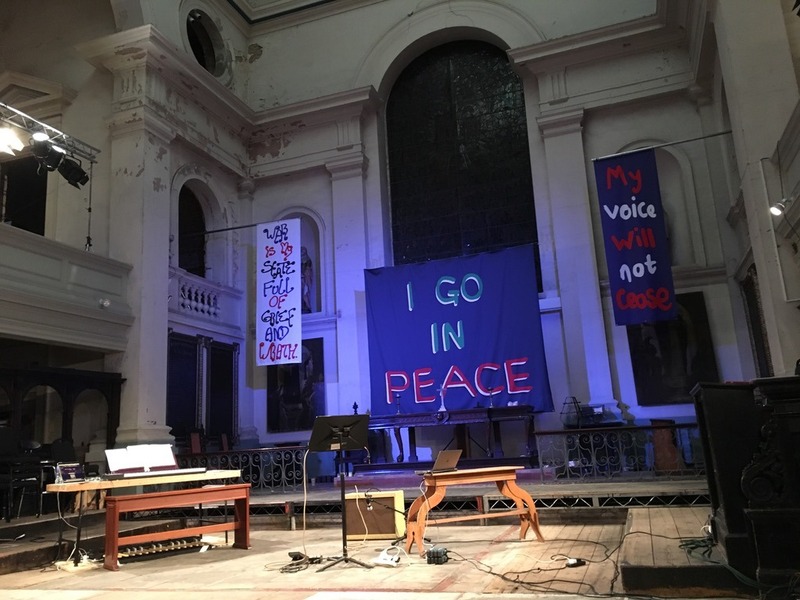 Hyperchromatic Counterpoint is part of Spitalfields Music Festival 2017, running in venues across East London until 10 December.